Suffer from unwanted yellow and copper tones in the bleached hair? 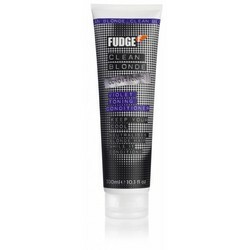 The products of the Fudge Clean Blonde remove these unwanted tones and make the blonde hair look pretty blonde. The shampoo is also known as violet shampoo, blue shampoo and purple shampoo. It protects you from the nightmare of copper-colored or yellowish hair. The silver shampoo makes the hair healthy, lively and beautifully shiny. These products give the blonde (colored) hair the attention and care it deserves. Enjoy beautiful blond hair longer with this silver shampoo and silver conditioner. 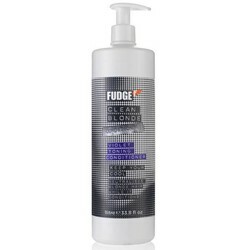 Fudge Clean Blonde Violet Toning Shampoo eliminates unwanted copper and yellow tones in the blonde hair. This shampoo contains the Hydrating Hair Drink Complex (HHDC), this complex ensures that the hair is lively and super healthy. 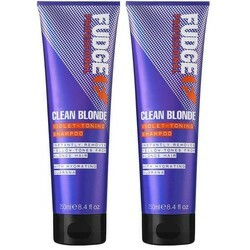 The Fudge Shampoo Clean Blonde Violet Toning gives the blonde hair a brilliant shine. 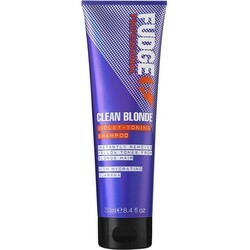 Fudge Clean Blonde Violet Toning Shampoo has been specially developed for blond hair and hair with blonde shades. Also called silver shampoo. This shampoo prevents a yellow color in the hair and works extremely well. The hair will be smooth, easy to comb through, soft to the touch and will come into shape more easily.